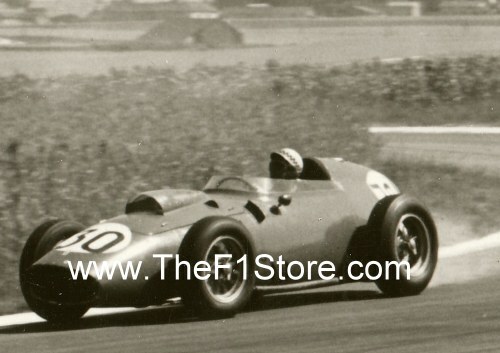 Vintage 1959 photo of Jean Behra on Ferrari 246 at the Grand Prix of France at Reims. 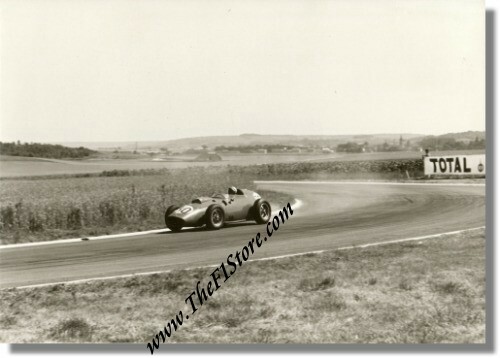 This vintage original 1959 photo shows Jean Behra's Ferrari 246 blowing smoke as a piston is on the way out on July 5 1959 during the French Grand Prix at Reims. Jean ran in 6th postition when a piston expired in lap 31 which put him out of the race. This picture is one of the last there is of Jean as a Grand Prix driver as this was formally his last Grand Prix and he died less than a month later (on August 1, 1959) when he crashed his privately owned Porsche at the AVUS ring in Berlin. The photo measures some 17.5 x 12.5 cm or 7 x 5 inches and is in good condition. The back carries the stamp of the photographer.